Car license plate in Germany, where does a car come from? Car license plate seen in Germany and find out where it comes from? If you have seen a registration plate in Germany and want to find out where it comes from you can look up German car number plates sorted alphabetically with the first letters AC DF GJ KL MN OR ST UZ and the starting numbers 0-9 . You can also search for German license plates online in our online license plate search. 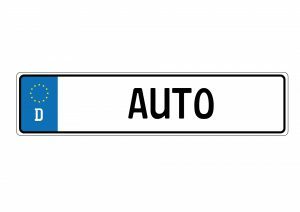 Car license plates in Germany can be classified into different categories such as normal EU license plates, seasonal license plates, license plates for classic cars, short-term license plates, change plates, wish plates, etc. In Germany in 2014, a total of 53 million vehicles such as cars, trucks, etc. were registered, so about 658 vehicles per 1000 inhabitants. For a registration number to be recorded in the central vehicle register, it has to be registered, re-registered or deregistered in the responsible registration office or civil office . In Germany there are different types of license plates. Licence plates in Germany are mounted on cars both front and rear of the vehicle and possible trailers. They must be mounted horizontally and clearly visible with a tilt angle of maximum 30 ° . They must be permanently mounted, except for only trial, transfer and workshop trips. How are German license plates structured in Germany? The distinguishing marks of the license plate consist of a maximum of 3 letters, which give the competent administrative district in which the car was approved. The abbreviations are set by the Federal Ministry of Transport, Building and Urban Development and can be abolished by this again. If the case occurs that they lead a distinguishing sign on the car that was abolished again, they can continue to use it until the vehicle is shut down. As part of the license plate liberalization , one abolished license plate was also released for award again. Since January 1, 2015, you must be able to retain your license plate when moving within Germany. Thus, it is possible that a license plate from Munich „M“ in Berlin „B“ can be used when moving from Munich to Berlin. It still has to be reported to the responsible licencing authority. The re-labeling requirement is therefore eliminated. So the distinguishing sign does not have to show the origin City. The distinguishing mark may not be changed by the holder in such a way that it is rendered unrecognizable by changes etc. Frequently, the question „where does a mark come from?“ With regard to the distinguishing sign also arises . Here you can easily see where a German license plate comes from. The identification number follows the distinguishing sign and contains 1 to 2 letters and up to 4 numbers. In sum, the number of characters on a German license plate must not exceed 8. The identification number is used to uniquely identify a holder. License plates in Germany receive two types of seals on the front and rear license plates. There is the seal of the country, with the seat of the responsible registration authority and the TÜV security seal . The seals are directly attachted to the license plate at the registration office. The TÜV-affixed round badge provides information of the next due date for the main inspection (HU). The badge is read as follows: In the middle of the badge is the year of the next HU and the month at the top of the 12 o’clock position of the badge indicates the corresponding month of the examination date. Until 2010, there was still a square sticker for the emission test, so that both plates front and rear received a round and square plaque after passing the TÜV. Today, the emission badge is integrated in the round HU badge. For electric cars there is a separate badge which can be used, among other things, for free parking. Who drives completely without license risked a fine in the amount of 60 euros. A bad readable, dirty license plate costs 5 euros fine, and who tries to make his license plate for a radar control unreadable with the help of slides etc. (test have shown that this is ineffective) risks 65 euros penalty. One does not have to expect a point in Flensburg, since this is granted if the safety in the traffic is acutely endangered and the cover here is usually carried out only to escape a radar control. Federal, State, Diplomatic Service and International Organization vehicles are assigned special identifiers containing only numbers in the identification number and no letters. As a rule, the license plates are given fewer letters for the location marking the more inhabitants the place, city or district of the registration office has. „Big“ cities therefore have „short“ license plates and „small“ cities, districts or places rather longer. For example, large cities such as Berlin or Wuppertal have only one letter on the plates namely “ B “ or “ W“ . The most important exception here is Hamburg, because there “ HH “ stands for Hanseatic City of Hamburg and not, as might be expected, only the letter “ H „. This was namely assigned to Hannover, the next smaller city in terms of population of Hamburg. License plates in Germany are defined by the DIN standard 74069 in terms of format, font, colors, reflection type. Most of the license plates are made of aluminum and since 2006 there are also self-luminous license plates. The manufacturer is stamped on the back of the plate such as 3M or Utsch. German license plates have the format 110 mm * 530 mm in height and length in single-line design, and 200 mm * 340 mm in height and length in two-line design, such as those required for import vehicles from America. The rear license plate must be illuminated unless it is one of the new self-illuminating plates . 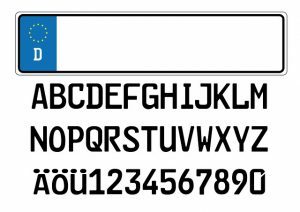 With the introduction of the Euro license plates in 1994, the FE font was introduced on the license plate, this allows a better distinction of some letters compared to the 1956 introduced DIN plates. Thus, the letters B, F, G, I, O and Q were previously blocked directly after the local code or circle abbreviation, due to poor distinctness in reading. Surveillance camera systems can read this license plate easier, error-free. Thus, with the introduction of the license plates and the combination options have increased in the license plates and new desire signs has become possible. The FE font is available in middle type, reduced central font and narrow (Engschrift). Standard here is the middle font. If the space on the license plate is insufficient, as with 8-digit EU plates, the Engschrift is chosen as an alternative. In the height (75 mm), the two fonts do not differ, but in width, so in the Engschrift the letters are only 40.5 mm wide and 38.5 mm numerals. The capital letters are 47.5 mm wide and 44.5 mm. The smaller central font is used on smaller two-line license plate as well as on motorcycle registration. The letters are 31 mm wide, 29 mm wide and the height is 49 mm. 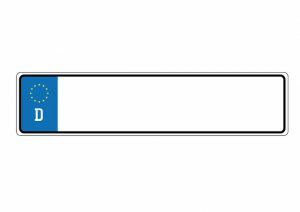 Furthermore, the national license plate is integrated on the new euro license plate which otherwise had to be attached in some countries as a sticker on the vehicle for foreign trips. In the registration authorities it is also possible for the license plate to realize his own wishes regarding the license plate, ie a separate letter and number combination according to the obligatory letter identifier for the place, for a surcharge if this license plate is not yet taken or was released. This license plate is also called wish plate (Wunschkennzeichen). Some cities also allow you to check the availability of your wish plate online and reserve it online. However, there are some exceptions, such as letter combinations such as HJ, KZ, NS, SA, SS are not allowed and some offensive combinations that may not be granted. Even some number combinations such as 1888, 188, 8818, 8888 or 888 are sometimes not granted by the registration authorities. Which license plate formats are there? In principle, the maximum dimensions must not be exceeded, if a license plate does not fit into the provided holder, the holder must make modifications to the car. If the changes are, in the opinion of a recognized expert, associated with a disproportionate effort, for example, in classic cars or US vehicles may also be a deviating from the standard indicator, such as a foil plate is issued by the registration office. Perhaps yu have already seen markers that shine themselves, so be evenly lit from behind and not be illuminated by the license plate lights from the outside. The electroluminescent markings consist of a transparent plastic disc which is light-conducting (by an electroluminescent film, EL foil), on which the black letters and numbers are placed, this method has been improved over the years to mark with EL film. The plates with EL foil, the numbers are stamped on a plate previously laminated with an EL foil and a reflective foil, the power supply takes place via a ribbon cable that is connected to the car’s board network. Thus, it is a fairly expensive license plate. In the case of license plates with backlit LEDs , they are no longer on the market today. They consist of a plastic frame with LEDs whose light has been reflected by a special license plate. Self-illuminating license plates are approved by the Kraftfahrtbundesamt and use standard EU plates. These are illuminated by a LED surface with a conductive surface and a transparent plastic lens. The problem is that the illumination is not quite uniform and that you have to remove the indicator in the main investigation, so that the plaque can be renewed. The advantages of self-illuminating license plates in Germany are in good illumination and thus increased road safety and they are also more economical in power consumption than the conventional license plate lighting. What documents are required for the registration of a license plate in Germany? The proof of the last main inspection, should usually be noted in the vehicle registration on the last page with stamp of TÜV, Dekra etc. If the vehicle was financed by credit, the lending bank is also to be informed about the re-registration. Since the 01.01.2015 it is possible thanks to the nationwide license plate driving a license plate in Germany even with a move beyond the borders of a federal state to keep the mark. For example, you can move from Munich to Hamburg and keep the license plate with the letter “ M “ . However, one must report the move of the vehicle to the registration office of the new place of residence, missing it can cost 100 € fine. The embossing of a new license plate is not necessary. So a beloved mark on which you may be particularly attached, as it is your own initials, date of birth, founding year of the football club, etc. continue to retain even if you move to another region or city. However, in the case of car owner change (in the case of sale, for example) in another region, a new license plate corresponding to the region is necessary. In addition, the change has to be declared because the car insurance is also calculated on the basis of the registration place, so if you move to another region may also change the insurance contribution, regardless of whether you keep the old license plate code. Because for the insurance premium, the location of the new registration office is crucial. License plate liberalization means that registration districts can now issue more than just a license plate number, and even previously assigned distinguishing marks from distressed districts and county-level cities that may be in the administrative district can be reassigned. Thus, old license plates are possible again. For example, the distinguishing feature WAT for Wattenscheid can be reassigned in the city of Bochum BO in addition to the usual BO . In this way, there are also new combination options for the desired license plate . Also new since 2015 is the possibility to deregister his vehicle online, further services are planned at the Federal Motor Transport Authority . The service is made possible by security codes on the license plates and vehicle registration. So you can avoid the authorities with the new identity card and PIN.